Yet again 2016 has thrown up another challenge to test us. Back in mid July and totally out of the blue we were given a two month notice to quit our rented house after a period of twenty years. To say it was a bit of a shock would be an understatement but of course that is one of the drawbacks of living as tenants. After all that time we had not only made it our home but also enjoyed the country location with open views. Still, it had come at a very important time, just when I was putting the final touches to completing the book and I certainly didn’t need this extra concern hanging over me whilst trying to concentrate on my work. We took the decision to make a quick move to somewhere local here in Teesdale and we happened to find another property to rent which was vacant. So over the past 5 weeks we have had to put all of our time and efforts into making a full house move, this included clearing out of the old house and garden and then moving into the new cottage. One of the highest priorities was to re-locate my framing equipment into a new workshop which I was fortunate to find a short distance from the new house. Obviously during this time my artwork and writing was put on hold, delaying the book publication once again. I was also unable to update the website with news until we were completely unpacked and settled. I also stayed away from the time consuming forces of social media. So here we are in our new house, a location which is even more handy for the A66 and to get to the lakes and beyond. It is also very handy for the pub! The studio has been downsized but more than enough space for my needs and Bailey seems to have settled in ok. The new workshop, only a short distance from the house and once again slightly smaller and compact but all the equipment fits in neatly. 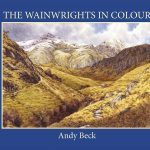 Now I can get back to the task in hand, completing the Wainwrights in Colour Book. I appreciate that some of you will have been wondering as to whether there is a publication date yet but as you will appreciate this unexpected change in our lives has delayed the process once again for which I apologise. Don’t worry though, no one has more interest in seeing the book out than me and as soon as I have a date of publication it will be well publicised and those already on the list for a copy will be the first to know. I work on the book everyday and even I still get a thrill from seeing this huge project nearing completion. I will post updates on this website or on my social media pages as soon as I have any news. Thank you Richard, it is good to be back at work but it may be some weeks before I am back on the fells as I need to catch up on 5 weeks of work. Sometimes, an unwanted/unexpected change can be a change for the better. Good luck in your new home and business premises. Thanks Macca, yes, we are now taking a positive attitude to this turn of events but it certainly wasn’t something that I needed at this stage of the book. Looking forward to receiving my pre-paid copy of the book. The time scale seems to ever extending but I’m sure it will be worth it. Yes, I can only apologise for the delay, some things have been just beyond my control. Trust me, the wait will be worth it.